And thus I would be teaching the Dhamma.......anyone can do this.....it does not take any sort of credential to teach anything anywhere anytime.....but to be a good teacher one must know ones limitations and point out the existence of other points of view and be sure to make that part of every lesson. ...and of course I agree with you. 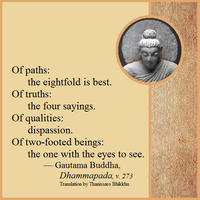 Of course if I am asked a question about Dhamma, I will answer it as best as I can, I would not hold back. But no one is disputing that. I think that what some of us have been discussing here, is more the idea of laypersons such as ourselves 'going forth to make converts to Buddhism'...That is the bone of contention here, rather than whether we should answer simple questions put ot us (to which the answer is, yes, of course we should!). The word "convert" has been given bad connotations by Christian missionaries and their questionable objectives . But in Buddhism, converting one from adhamma to dhamma is about the greatest good one can do. The Buddha says the gift of Dhamma is the greatest gift and the only way one can repay the kindness of parents is to establish them in the Dhamma. Seems that what you describe as converting in buddhism is the exact same thing as converting in christian missionary work.....even the mind set that it is the "greatest good one can do" is the same. when i teach guided metta meditation, i dont say stop believing in jesus and muhammed and take refuge in the triple gem. i say visualize someone you love and wish them well. not much of a conversion. ever been to catholic church and experienced everyone shaking hands and saying peace be with you? sounds like metta to me.